After the Half- Ironman last week, I really had no plans for the upcoming weekend, but I knew I needed to get in some good training and especially on the bike. 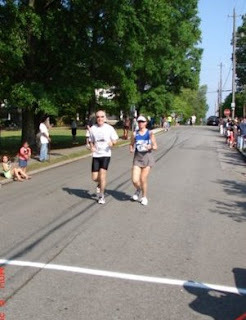 Normally on a Saturday morning if I am not racing I am planning a long run with the Marathon Princess. But this weekend she was going to race the Clayton 5k on Saturday and the Garner 10k on Sunday so I was planning to put in a long bike ride. As I was thinking about how far and where I wanted to ride I decided, why not bike to Clayton, run the 5k and then bike home? It would be sort of like a reverse duathlon and I would get to run a little with Karla and see the Scott's too. So I got up early and drove into Zebulon and parked at my church and just before 7am, started the ride over to Clayton. I estimated it to be around 20 miles and the route I chose would have little traffic and only 2 turns after leaving the block from ZUMC. It was a beautiful morning, around 70F already and nearly perfect for the ride. One good thing was that the morning sun rising was behind me so I didn't have to worry about the few cars on the road being blinded by the sunrise low on the horizon. I was feeling great and even though a little wind was picking up and in my face most of the way over, it was not enough to bother me. And I was being careful to drink plenty and take in some calories. 19 miles later I arrived in Clayton and after signing in for the race, I surprised Frank, Karla, Bill and Margo. We had a good time talking and then about 20 minutes before the race, Karla and I went for a warm-up mile before heading over to the starting line. It was turning out to be a hot morning, already in the 80's and humid. We were glad to get the race started and settled into our pace. Neither one of us are in great short racing condition right now and the pace was a little slow but you have to start getting into racing shape somehow so why not race! I'm glad I had decided to run with Karla because I don't think I could have run much faster anyway and especially after riding the bike to the race. The course is a bit hilly too. No major hills or steep climbs, just lots of little rolling hills. Our pace was pretty steady and even the first two miles but we slowed a bit on the 3rd. It is predominately uphill and the heat was taking it's toll. It was a good time and we all hung around for the awards ceremony so Margo could get her award for winning her age-group. Then it was good-bye and I climbed back on the bike for the ride home. It was a little easier going the other way with the wind at my back more than not. It's also easier climbing up from the Neuse river heading away from Clayton. After getting back to Zebulon I added another spur to the course which added another 12 miles onto the 19 back giving me a great workout for the day of 51 miles of biking and 4 miles of running. I felt great, got in a good workout and spent some time with friends. A great way to start the weekend. So how was the test at White Lake?